I always used to think of archaeologists as people who dug up the remains of Roman settlements and prehistoric burial chambers, but in the last few years they seem to have been examining a much wider range of sites, working with specialists from other disciplines to tell us much more about the relatively recent past. In so doing they are explaining not just the progress of invaders, or the rich and powerful, but about ordinary people. 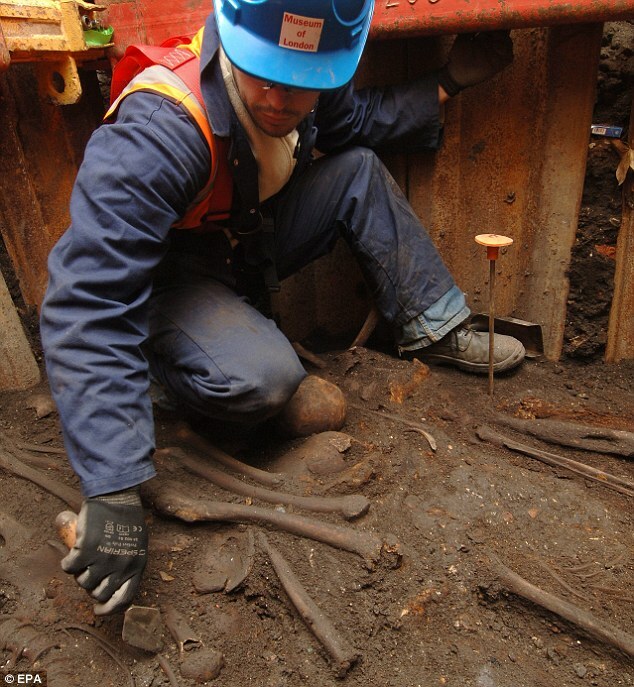 I’ve been fascinated by the work done by Museum of London Archaeology to find the remains of the playhouses of Shakespeare’s London, and even evidence of the activities of the audiences. These have been outlined by Julian Bowsher in his book Shakespeare’s London Theatreland. At least partial remains of the Rose, the Globe, the Theatre, the Curtain and the Hope have all been found as well as bear-baiting rings. These provided entertainment of a different kind, though the fact that they existed in close proximity is a reminder of the options available to Elizabethans in exchange for their pennies. This page contains a link to the trailer and here’s the account in the Daily Mail. Seal’d up the doors and would not let us forth. The 1665 Great Plague killed 75000, around a quarter of London’s population, and they have excavated a staggering 3000 of the 20000 skeletons thought to have been buried at Bethlem. It’s been described as “a vast poor man’s graveyard from the era when modern multi-cultural Britain was born”. 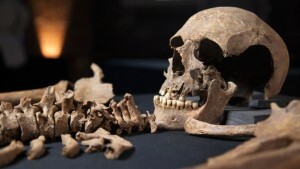 Archaeologists have been working with microbiologists and palaeontologists to analyse the bones and test DNA, comparing results with the historical parish records to reveal the names and life stories of some of the victims. Matthew Symonds explained “Historical records will be from the more educated and better-off sections, but this is something that tells us how everyday people lived their lives.” Reassuringly for my preconceptions, the archaeologists have also found the remains of a Roman road. Their Facebook page also contains additional information, and the excavation will remain open until 23 July. Coventry was the nearest place of any size to Stratford and was an important city, enjoying a measure of self-government. We can’t be sure that Shakespeare ever visited Coventry himself but he was certainly aware of its history, as he refers several times to events that happened there. Act 1 Scene 3 of Richard II, the great formal scene where the court assembles to witness the fight to the death of Bolingbroke and Mowbray, is a dramatisation of a real event that took place in Coventry in 1398. Parliament met in Coventry on a number of occasions from the reign of Henry IV to Henry VI making the city the temporary seat of government, in particular during the Wars of the Roses. During Shakespeare’s lifetime Queen Elizabeth herself stayed in the city. 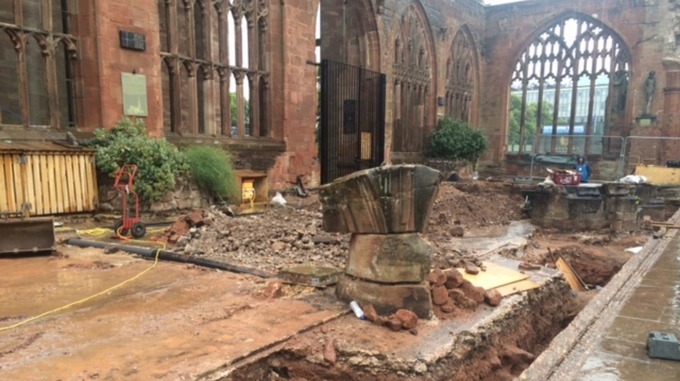 The discoveries being made by archaeologists are reminding people of Coventry’s distinguished past, as well as the no less interesting, lives of Londoners from Shakespeare’s period and beyond. This entry was posted in Legacy, Shakespeare's World and tagged archaeology, Bedlam, Bethlem, Coventry Cathedral, Julian Bowsher, King Lear, Museum of London archaeology, Richard II. Bookmark the permalink. Thanks for this Sylvia – I’m not sure I’d have spotted the programme if you hadn’t written this piece. It was grim but fascinating. Interesting that they quoted both Thomas Platter and Robert Greene. Also irritating in some ways – not sure what images of modern Londoners dropping dead and getting into knife fights added to it but perhaps they thought the audience couldn’t take too many images of the skeletons! Also why not show clearly pages from the original registers rather than apparently re-creating ones with “old” handwriting? Shame they didn’t use Miranda Kaufman or Michael Wood on black Londoners. Channel 4’s website is hopeless at pointing to further information – I had to dig around (sorry!) to find some. Crossrail has a website on its archaeology here – http://www.crossrail.co.uk/sustainability/archaeology/ . They have made available the register of burials compiled by volunteers from City of London parish registers (mentioned in the programme) here -http://www.crossrail.co.uk/sustainability/archaeology/bedlam-burial-ground-register You can narrow it down by parish and/or years, search for names or cause of death, or just browse the list which is in chronological order. I wonder if HS2 will have any archaeology involved when it destroys 30,000 graves in the course of creating the rail line? Many thanks for this comment and the attached links, particularly to the way in which it’s possible to search the registers. I didn’t manage to find that!